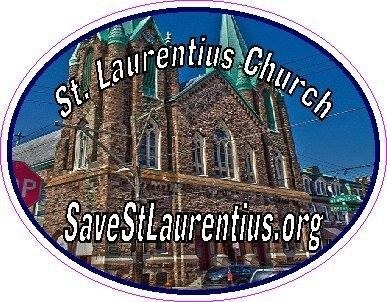 Purchase a window cling for $5 and show your support for St. Laurentius Church! These clings can be hung on both the inside and outside of windows. Clings can be mailed or hand-delivered to you. Email savestlaurentius@gmail.com to purchase. Will window clings be sold at St. Laurentius School Spirit Day? Not officially – at least I don’t think so. However, I’ll have some with me. My name is Patricia, I’ll have a blue spirit day shirt on, and I’ll be working the craft table. Why does it have to be undercover ? The children need to have a church and lunchroom . I could not agree with you more. But the Save St. Laurentius Committee is a separate entity from St. Laurentius School. I happen to be one of the volunteers on Friday so I will have some with me. This is not undercover; I will have them available for you or anyone else who wants one.